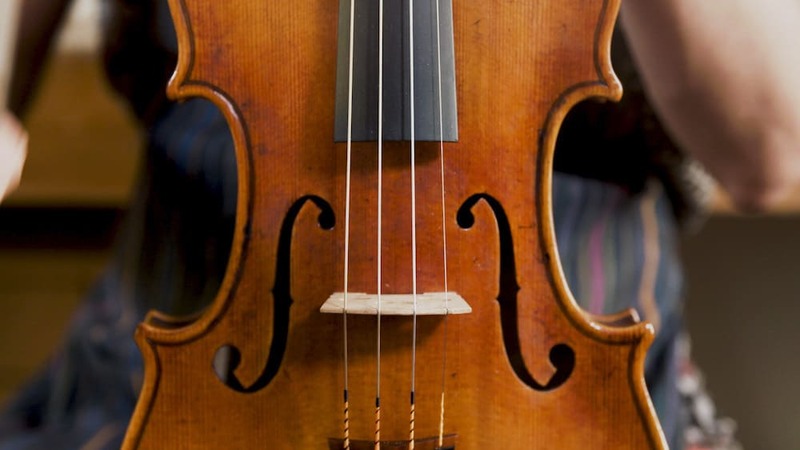 Whether you’re new to playing violins or you need to replace your current instrument with a better one, we can offer some advice. Based on the results we’ve got after carefully looking at various indicators such as customer reviews and quality, we can say that the choice for the best Cremona violin is the Cremona SV-600. This violin is handcrafted by skilled luthiers and features close-grained solid spruce and flamed durable maple wood. Moreover, due to the neatly inlaid purfling, the edges of the violin are fully protected. The set is completed with a bow manufactured from carbon fiber and an oblong lightweight case for easy transportation. Should you not find the Cremona SV-600 in stock, another great option is the Cremona SV-130. Cremona’s SV-600 is part of the top-notch violins category, given that it’s carefully handcrafted by one of the best luthiers out there. The construction includes the finest close-grained solid spruce and flamed solid maple as well. Of course, each element is shaped and designed to render the finest tone possible, given the premium quality of this violin. Some users have felt the need to replace the bow, as for them it towed to one side or another too much. If you know you have a preference in this matter, you might want to keep this in mind. With superb crafting and delivering rich and even tones all across the four strings, this model is one you should take into consideration for your next purchase. Outfitted with Swiss-style ebony pegs, each of the SV-130 violins comes with special strings that are preferred by most of the professors out there. The lightweight tailpiece includes 4 smooth tuners that render the tuning easy and fast. As you’ll probably be practicing for hours, the low profile Kaufman chinrest is designed with comfort in mind. In some situations, the case was damaged during delivery, so if this happens, you can contact the seller. Moreover, as you get more experienced, you might need to get an upgraded model. The SV-130 is a very good alternative for a beginner, especially as it’s easy to start using right away. If this is what you are looking for, don’t hesitate to try it out. Suitable for both beginner and advanced players alike, the Cremona SV-500 is an outstanding violin crafted from the finest selection of wood. The design features a clear and transparent varnish that accentuates the grained spruce and maple construction, while the violin itself includes high-quality Swiss-style ebony fittings and fingerboard. As there will always be preferences when it comes to different elements, for some users, the bow that this model comes with could be improved, so you might have an additional cost here. An excellent choice for all types of players, this model offers numerous benefits that make it a very good addition to your list of favorite musical instruments. In order to help you decide faster, we’ve gone through various reviews and made a list of some of the most highly praised products that are suitable for any musicians. You can take a look and see if you can find the best violin from Cremona among our top suggestions. 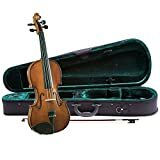 Any violin player wants an instrument that is made from top-notch quality materials because they provide great tonality and plenty of durability. This violin is the ultimate choice because it is handcrafted by one of the best luthiers in the world. Plus, this piece is made of the finest close-grained solid spruce and flamed solid maple. Each element is carefully shaped and designed in order to enable the finest tone possible. Moreover, the violin features a neat inlaid purfling that is meant to protect the edges of the instrument as well as a beautiful orange varnish finish applied by hand. The best part is that this piece of instrument is able to deliver a rich and even tone all across the four strings. In addition, both the fingerboard and the trimmings are built from sturdy quality Swiss-style ebony. The product package is completed by the balanced fiber carbon bow. 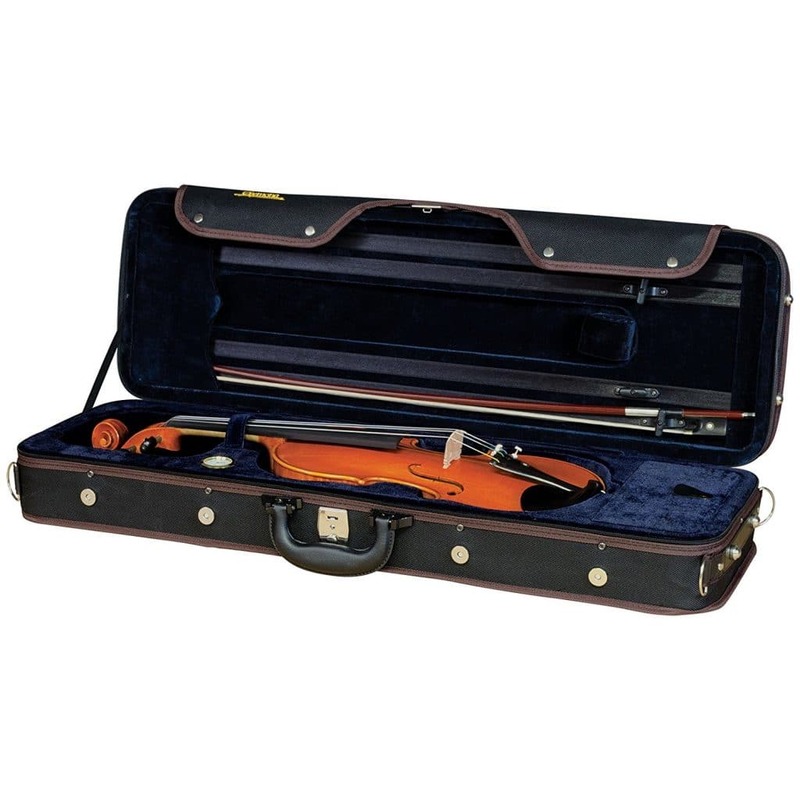 You can easily take the violin with you to your lessons or gigs using the oblong case which is constructed from a lightweight foam. If you’re in the market for an affordable violin that offers excellent performance, you should consider this model because it is outfitted with properly fitted Swiss-style ebony pegs and lightweight tailpiece with 4 smooth tuners that enable fast and easy tuning. Each violin comes with special strings that are preferred by the majority of violin professors around the world. Since mastering the violin requires hours and hours of practice, you need a proper instrument that doesn’t cause your body to suffer from fatigue or back pains. With this violin, you can put aside these issues because this piece is built with a low profile Kaufman type of chin rest that is comfortable to use. Furthermore, the neck is oiled in order to provide a better feel when playing the violin and the bow is incredibly well-balanced so you can get a fast response. Both the fittings and the fingerboard are made from durable ebony while the body is hand carved from solid maple. One of the most popular violins among beginner and advanced players alike, this piece is simply outstanding and crafted from the finest selection of woods. As far as the body of the violin goes, it has a clear, transparent varnish that accentuates the grained solid spruce and solid maple. Also, the varnish is a tad shaded so it can give the violin the appearance of an old instrument. It is hand applies, and it has a reddish-brown shade of color that completes the overall look. Those of you that appreciate art and fine musical instruments will be glad to notice that both the edgework and the purfling are clear and the scroll is carefully cut. Plus, the violin is equipped with quality swiss-style ebony fittings and fingerboard. The tailpiece is manufactured from lightweight composite to ensure easy tuning. Comfortable and easy to use, the violin is set up from the very beginning, and the chinrest is low profile and specially designed using the Stradivarius-style. 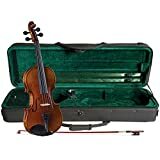 This violin is recommended by many musicians because of its properly fitted pegs and high-quality tailpiece that comes with four fine tuners for fast and easy tuning operations. 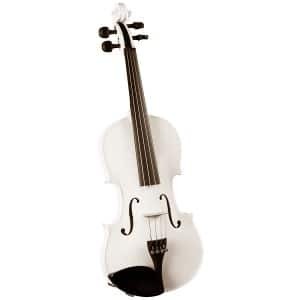 Even if you need to use this violin for numerous hours of practice or long music concerts, you’ll still feel great, and your body won’t get tired due to the low-profile Kaufman-style chinrest and oiled neck that increase your level of comfort. Not to mention the violin bow that is specially balanced so you can play the violin without putting too much pressure on the strings. On top of that, the instrument features the ideal string height and spacing that ensure an accurate finger position and boosts the level of intonation. Made from an excellent wood selection, this violin comes with hardwood fittings, and a solid hand carved spruce and solid maple body. The piece benefits from a sparkling color finish that is warm translucent brown or red, depending on your choice. You won’t find a better violin like this one because it looks incredibly sleek and stylish. Also, its manufacturing material is a genuine proof of excellent performance. One important feature worth mentioning is properly fitted pegs made from a sturdy hardwood. The tailpiece is manufactured from a lightweight composite material and features four smooth fine tuners that come in handy for the tuning process. Besides the vivid color, the violin is incredibly easy to handle. No matter how many playing sessions you use it for, this instrument will feel like a feather in your arms. Thanks to the low-profile Kaufman-style chinrest as well as the silky neck, you won’t feel the pressure of holding the violin while playing. Because the violin is intended to ensure an excellent finger position and proper intonation, this instrument is built with the perfect string height and spacing in mind. Quite durable, this piece of violin comes with hardwood fittings and a solid maple body construction. Because every respectable musician needs an instrument to ensure his violin skills are well developed, you should give this model a chance. Every piece comes with top-quality strings that won’t break easily no matter how much violin practice you do. The first thing you’ll notice when purchasing this violin is the great fitting of the hardwood pegs and the lightweight tailpiece which is outfitted with four fine tuners that you can use to quickly set up the tone of the violin. The vast majority of violin players often complain that because they have to sit for a long period of time with the violin close to their chins, they feel tired afterward. Plus, the hands suffer a lot due to the pressure exerted on the bow. You can say goodbye to this hassle because this violin is equipped with a low profile comfy chinrest and a cozy neck that provide a great feeling. Moreover, the bow is well balanced, so you won’t have to push hard the strings. If your biggest desire is to find a violin that has a traditional and elegant look, you don’t have to search further because this option right here has everything you could possibly need. In order to ensure that unique classical look, the violin has a flamed maple body with a translucent red finish. Also, the instrument is suitable for all types of musicians, from beginners to advanced. The violin meets all the necessary quality requirements, and the manufacturing includes high-grade ebony fittings and four great tuners. Plus, the ebony pegs feature an excellent fitting according to Swiss rules. Not only does this violin looks great but it also sounds incredibly clear. The instrument is completely hand carved, and the body is made of a solid maple. 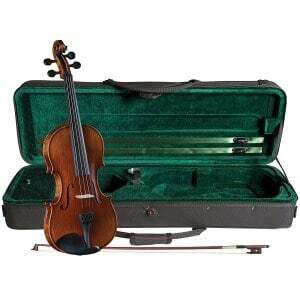 The product package contains an oblong violin case that comes with a built-in hygrometer. This way, you can easily carry and store your violin in complete safety. 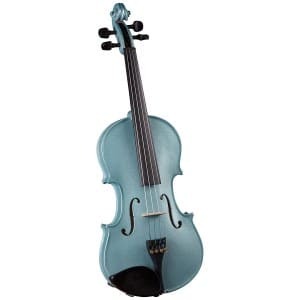 It’s really not that easy to get an affordable violin that ensures the same level of quality and excellent sound. You’ll definitely fall in love with this violin because it has all the important features that a musician’s needs to play the violin properly. For instance, it had durable pegs made of hardwood. These are perfectly fitted while the tailpiece is extremely lightweight. We shouldn’t overlook the four fine tuners that are mandatory for an exact and fast tuning operation. Because comfort is a must when playing the violin, this instrument is an excellent choice if you’re tired of having back and hand aches at the end of every violin session. Therefore, this violin features a low-profile Kaufman-style chinrest that removes any effort on your part. As far as the bow goes, there’s really no need to apply pressure to your movement because it goes smoothly with the provided quality strings. The violin has a lightweight construction, and the fittings are made of sturdy wood. Many people face a difficult decision when having to choose between several models of violins. It’s quite difficult to determine which one sounds better, whether it suits your style, and if it is comfortable to use for long sessions. If you’re in the market for a good Cremona violin, you should first learn first the basics of this type of instrument and what matters most in terms of quality and features. Depending on your skill level, you have a great shot at finding a Cremona violin for sale that looks and sounds that way you’ve always dreamed of. Just read the following buying guide, and your job could get a tad easier. When you’re a student, you need to determine the type of violin that will suit as a guiding path for the years to come because you’ll be learning different techniques that need to be thoroughly developed. If you’re already an advanced violin player, you probably know the drill, and you’re in the game for a quality Cremona violin that you can use for music gigs. No matter the model you decide to get, get the proper size because if the size doesn’t fit you well, you’re risking your health. You should take into account the age factor, the size of the body along with the hand shape and strength. According to the majority of the Cremona violins reviews, violins can be purchased in nine sizes. Starting from the age of 11 and older you need standard or full-sized violins or 4/4 size. Children, on the other hand, use other numbers such as ¾, ½, 1/16, and so on. If you’ve got no clue about your violin size, there is a simple way to find out. All you have to do is to measure yourself starting with the base of your neck and ending either with your wrist or center of the palm. Then, you can consult a chart provided by the manufacturer, or you can look for more information using the online resources. Another crucial aspect is related to the craftsmanship and the materials used in the process. Although violins were perfected more than 300 years ago, there haven’t been major changes ever since. 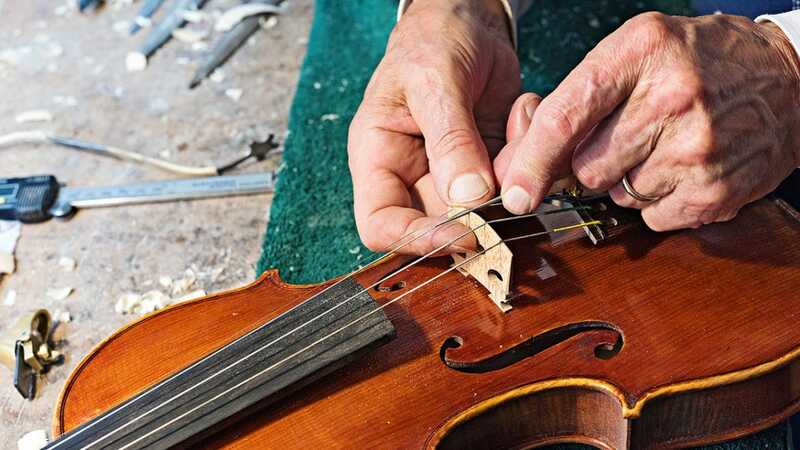 Even today, violins go through the same procedures and stages of manufacturing. 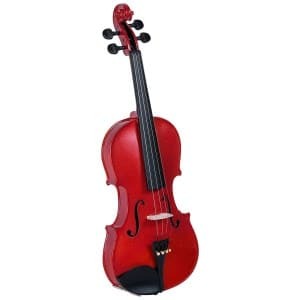 However, if you’re budget is somehow limited, and you need to choose a cheap Cremona violin, you should search for intermediate and beginner instruments that are known to be less costly but of good quality materials. Typically, violins are crafted from certain tonewoods like spruce and maple. This, along with the depth of the carving located on the scroll, indicates the level of quality and price tag for a violin. It’s important to be aware of this indicator because they make a difference between a top-notch violin and a mid-budget one. The deeper the carving is, the superior the craftsmanship will be. Apart from this feature, try to get a clear view of the joining areas around the body of the violin. Several reviews of Cremona violins point out that these areas must fit tightly. Otherwise, you’ll stumble upon different issues in terms of sound and comfort while playing the violin. In addition, the violin must feature a perfect symmetrical alignment. If you’re certain about what fine details to look for in a violin, it’s best to consult the experts on this matter. You can either speak to your violin teacher or consult someone that works at a violin shop. Or, you can always ask for information to that person that repairs music instruments. The reason why you should take their opinion and advice into consideration is that these craftsmen or luthiers, as they like being called, really love and appreciate violins. So, they are eager to share their knowledge with someone that has the same interest. Instead of giving your advice as a salesman would do, they can guide you towards a violin that suits your body and style of playing music. The setup process has a huge impact on the level of playability as well as the tonal quality, especially if you’re new to playing the violin. Even though you purchase a violin made from a standard material, the setup is crucial, and if not executed properly, the violin won’t provide the level of excellence you’re looking for. Among a few elements, you need to pay attention to we should name the nut which tells how hard you need to push the strings until they reach the fingerboard. If it’s too low, the strings make a buzz, and if it’s too high, you’ll have to apply too much pressure. As far as the bridge goes, just like the effect produced by the nut, it affects the way you play the violin and how fast it ensures a response. It must be fitted accurately right to the top of the instrument. Are Cremona violins any good? This award-winning company is internationally renowned for its high-quality stringed musical instruments and other accessories. Plus, everything you need for your Cremona violin you’ll find among their selection of products. Even though they are so affordable, the violins are made from top quality wood, and the majority of instruments feature flamed maple. This increases the quality of the violin. Cremona instruments are quite popular among student and intermediate players. Also, each piece comes with a beautiful case, bow, and professional strings. They have stylish designs, and you can choose between different sizes of violins, according to your body. How come Cremona violins are so cheap? The Cremona violins are manufactured with the intention of being used by any violin player, no matter the skill level. They are made from excellent materials, and the wood is durable as well as the fingerboard, pegs, and bow. If you decide to get a Cremona violin, you won’t be disappointed because the quality is obvious even at first glance. Their appearance is incredibly stylish due to the great varnish finish that imitates the traditional violin look. Also, if you’re a beginner or you’re just recently started to develop your playing technique, you shouldn’t spend your entire budget on an expensive violin. It’s wise to invest in several violins until you’ve reached the ultimate professional level.